Posted 12th Mar 2018 by Emmanuel . Engineered wood flooring appears precisely like solid wood flooring. One of the fantastic things regarding it is that it looks just the same as real wood. It was regarded as a poor relation to solid wood when it was first introduced, this is, however, different today. A high quality engineered wood floor misleads even the harshest sceptic into believing that the floor is or could be solid wood. Engineered wood flooring don't enlarge and compact to the same magnitude as solid wood flooring, and this is due to its smart construction. This implies that it is safer to fit in an environment where the moisture levels and temperatures fluctuate immensely. Besides appearance one of the leading reason why people buy engineered wood flooring is due to its less contraction and expansion. When it comes to construction, Engineered wood flooring has been constructed with multiple layers of plywood that are fastened together before being covered with a solid wood lamella or top layer. Engineered wood flooring production of boards in this manner means that they are ridiculously hard and resistance to any heavy footfall. Another reason for buying engineered wood flooring is because it can be re-sanded during its lifespan. Re-sanding it brings the floor back to life when it looks tired and warns out. 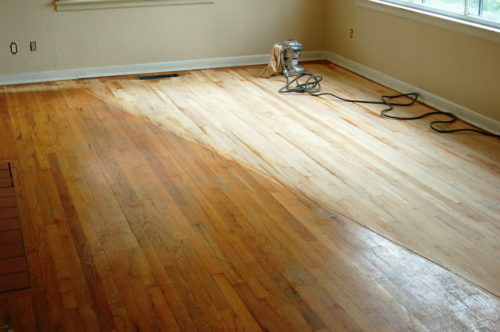 Sanding is also a way of getting rid of the stains and marks on the floor surface. In addition to re-sandability another reason for buying engineered wood floor is because once it re-sanded it can be refinished, that is protected and make it look like new again. This implies that the look of engineered wood flooring can be changed every time it gets old. Engineered wood flooring comes in a complete variety, the same way that solid wood flooring comes. Engineered wood flooring has the same range of its lamellas or top layers. Making it possible for you to chose and achieved any look you want as well as select the best finish to match your lifestyle. Different grades of wood signify that you can also change your choice to suit your budget. When it comes to boards, the solid wood board need a substantial large tree to produce them; this is however not the case with engineered wood flooring. Engineered flooring core boards are made of plywood, making it possible to find two or three strips engineered wood flooring with fewer joins across the floor, which enables fewer hours of floor installation. It is becoming more and more popular to find engineered wood flooring boards in parquet and chevron styles, allowing you to purchase your desired finished form and complete a beautiful parquet or chevron floor project in lesser times. When we talk about fitting, engineered wood is more comfortable to work and quicker to install compared to solid flooring. It is suitable for both Do it yourself and professional installers. There is also a click system, which is much easier to install than standard engineered wood flooring.